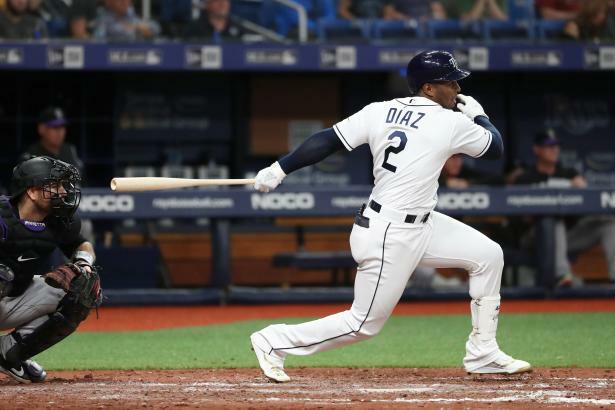 Yandy Diaz, 1B-3B, Tampa Bay Rays: Injuries to incumbent third baseman Matt Duffy have already created an opportunity for Diaz to ascend to the starting lineup. Diaz owned a .283 batting average and an impressive .361 on-base percentage in 299 major league plate appearances prior to 2019, but managed to slug just one home run during that span despite making lots of hard contact. The problem has been his tendency to beat the ball into the ground (57% ground ball percentage as a major leaguer). If the 27-year-old can make the adjustment to lift the ball more, he could finally unlock some of that hidden power upside and possibly remain a lineup regular even after Duffy returns. Willians Astudilo, C-3B, Minnesota Twins: In 2,461 minor league plate appearances spanning nine seasons, Astudillo compiled a .306 batting average with 29 HR and just 81 strikeouts. Those same elite bat-to-ball skills were evident in his first taste of MLB action, as he batted .355 and struck out only three times in 93 at-bats a year ago. Though catcher has been his primary position throughout his career, he has also appeared at second base, third base, and in the outfield. That versatility gives him multiple avenues to playing time. Don’t expect much in the way of power, but his history of ultra-high contact rates should make him a batting average asset and could help him wrestle away additional playing time. Dan Vogelbach, 1B, Seattle Mariners: Vogelbach hasn’t yet been able to translate the power and patience profile he has displayed throughout his minor league career into major league results. Consider that he has amassed a .291 batting average, .411 on-base percentage, and 60 home runs in 342 games at Triple-A, but entered 2019 with four home runs and a measly .197 batting average in 127 major league at-bats. The Mariners appear set to give him some playing time against right-handed pitching, so it wouldn’t be a shock to see him eventually work his way into a strong-side platoon and become a cheap source of power for fantasy teams. Isaiah Kiner-Falefa, C-2B-3B, Texas Rangers: Kiner-Falefa enjoyed a surprisingly solid rookie season in 2018, as he batted .261 with four home runs and seven stolen bases in 356 at-bats while appearing at catcher, second base, and third base. Those numbers may not sound like much, but they were actually quite useful in two-catcher leagues. The 24-year-old’s combination of decent speed, line drive stroke, and the ability to put the ball in play makes him a fairly appealing option given the dearth of quality at the catcher position. Garrett Hampson, 2B-SS, Colorado Rockies: After batting .311 with 10 home runs and 36 steals in 444 at-bats combined between Double-A and Triple-A in 2018, Hampson found himself squarely on the fantasy radar. Though he lost a spring training position battle to Ryan McMahon, injuries to both McMahon and Daniel Murphy have provided an opening for Hampson. If Hampson can make the most of his chances, he could very well stick in the lineup at second base even after McMahon is healthy. With enough at-bats, the 24-year-old has the capacity to produce a solid batting average with 25-plus steals. Hunter Renfroe, OF, San Diego Padres: Renfroe was thought to be in line to see most of the action in one of the corner outfield spots following a strong second half of 2018 in which he batted .246 with 22 home runs in 264 at-bats. However, a poor spring landed him on the bench to begin 2019. It remains to be seen exactly how manager Andy Green will divvy up playing time amongst a bevy of outfielders, but Renfroe’s 35-plus home run upside makes him worth owning in all formats. Alex Verdugo, OF, Los Angeles Dodgers: Widely regarded as the top prospect in the Dodgers organization, Verdugo has entered 2019 as the team’s fourth outfielder. He posted an outstanding .329/.391/.472 line (batting average/on-base percentage/slugging percentage) with 10 home runs and eight stolen bases in 343 at-bats with Triple-A Oklahoma City, and held his own in 77 MLB at-bats a year ago. Manager Dave Roberts figures to give the 23-year-old at least a couple starts per week, and we must also keep in mind that durability hasn’t exactly been one of A.J. Pollock’s strengths over the years, so it’s not difficult to envision Verdugo carving out a larger role. Matt Kemp, OF, Cincinnati Reds: Kemp’s days of being a five-category fantasy contributor are long gone, but he is still capable of useful production, as evidenced by his 2018 numbers (.290 batting average and 21 home runs in 462 at-bats). While the Reds have no shortage of options in the outfield, Kemp figures to see plenty of time against left-handed pitching and occasional action against right-handers. It’s also possible that he could be traded sometime this summer, which could put him in better position for at-bats. Raimel Tapia, OF, Colorado Rockies: Even after batting .288 with two home runs and five steals in 160 at-bats with Colorado in 2017, Tapia spent virtually the entire 2018 season at Triple-A Albuquerque where he slashed a terrific .302/.352/.495 with 11 home runs and 21 steals in 434 at-bats. However, he has made Colorado’s 2019 Opening Day roster as a reserve. Though it would most likely require an injury to one of the team’s starting outfielders in order for Tapia to get an extended look, the 25-year-old offers intriguing fantasy potential, if opportunity finds him. Eric Thames, 1B-OF, Milwaukee Brewers: A torn UCL in his left thumb cost Thames most of the first half of 2018 and playing time was hard to come by upon his return. He finished the season with 16 home runs and seven steals in 247 at-bats, but it came with a lousy .219 batting average. While the 32-year-old is presently without a starting job, he is just one year removed from batting .247 with 31 home runs in 469 at-bats, so he is worth stashing in most formats.